Kerala is a young state on India's southern tropical Malabar Coast known for its greenery, wildlife reserves, tea and spice plantations, palm-lined beaches and exotic cuisine. It's a world away from the hustle and bustle of elsewhere. Famed for its backwaters and home to a network of hydro-highways popular for sightseeing cruises, it's hard to deny Kerala's liberal use of the slogan 'God's Own Country', when traveling through the peaceful region. We meet early in the morning for a transfer to Tripunithura where we begin our ride to Paniyeli Poru, home to some of Kerala's most beautiful natural waterfalls. We overnight at a serene riverside resort. We cycle to the ancient town of Thodupuzha via spice farms and rubber plantations. After finishing our ride we stay overnight in a beautiful riverside resort. Transfer out to Erattupetta to begin our cycle towards Kumarakom. Stunning views of the surrounding area accompany us as we bike. 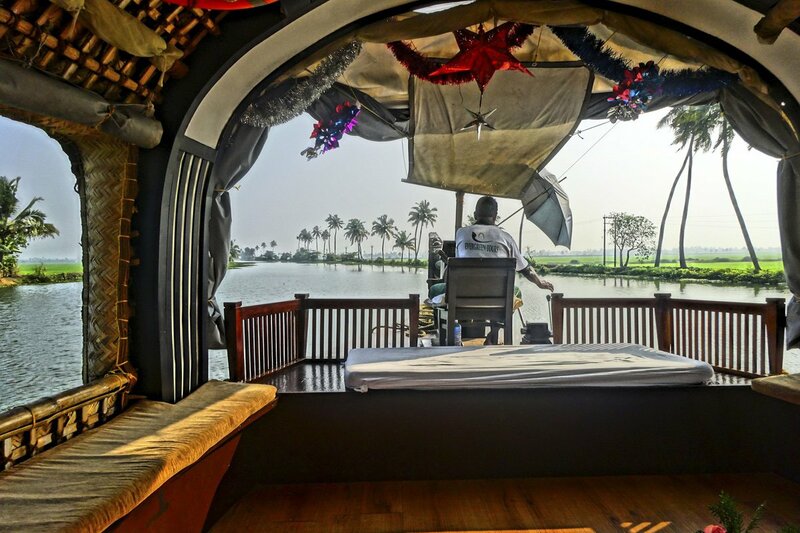 We cycle to the backwaters and enjoy sitting back and relaxing on a houseboat as the sunsets. We dock at Alleppey and it's back on the bikes for a ride along an old canal road, passing historic buildings. When we hit the sea we turn north along the coast to Marari beach for lunch and then continue riding past fishing villages as we near our final destination of Cochin. Day 1 - Cochin - Paniyeli Poru Ride 62km. +420m / -410m. We had a superb trip. Our guide and driver were excellent. It was a fabulous way to see Kerala with an excellent combination of cycling, eating local foods and the Kerala backwaters cruise was amazing. Very enjoyable ride with an excellent guide and driver. Nothing was ever too much trouble for him. Lots of food and drink. We didn't want for anything. The accommodation was excellent. Overall a great four days. Was the perfect way to see the lush countryside of Kerala and to get a taste of its food and culture. The ride was paced well by our attentive and knowledgeable guides who went out of their way to ensure that we were well looked after and able to complete this fascinating tour. We ride approximately 238 kilometres in three and a half days of cycling. This tour is on dirt and paved roads with some climbing, but distances are not too strenuous. We have designed the route to take in the best of Kerala’s culture, countryside and wildlife, all while enjoying an active holiday. The trip is fully supported and your guide’s expert knowledge of the area and terrain means that you always know what is coming up in terms of distance and difficulty. This makes a tremendous difference, as does the constant supply of bottled water and fresh local fruits. Biking Conditions: This trip is on dirt and tarmac roads and there is no technical riding involved on this tour. An air-conditioned support bus travels with the group to support us and participants can cycle as much or as little as they like and still enjoy the same views. Pick-up at central Fort Cochin hotel at 8 am. After a trip briefing we are transferred to Tripunithura where we hop on our bikes and ride to Paniyeli Poru, home to some of Kerala's most beautiful natural waterfalls. Poru in Malayalam means 'fight' and the waterfall was thus named because here the three tributaries of Periyar come together and seem to be engaged in a battle. There will be a few rises on our route, but nothing steep. We overnight at Whispering Waters, a serene riverside resort boasting a front row view of the surrounding rivulets and unspoilt nature. After breakfast we will ride to the ancient town of Thodupuzha. Passing fertile spice farms and rubber plantations along the way, we make our way to the historic town dating back to 300 BC when the Buddhist and Jain religions first made their inroads into Kerala. We will ride through undulating terrain, rubber plantations, forests, cross a river and visit a local village. Our destination today is Madaparambil resort – an exceptionally beautiful riverside resort. Continuing on our journey, we transfer to Erattupetta to begin our cycle towards Kumarakom. We are rewarded with stunning views of the surrounding area as we ride through rubber and spice plantations and arrive in Kottayam, also known as the Syrian Christian heartland of Kerala. Here grand churches dot the landscape with whitewashed facades and distinct guild ceilings. We finish our ride of the day when we hit the water's edge and the highlight of our tour. The backwaters of Kerala are expansive and the best way to ply them is by sitting back and relaxing on a houseboat. Revamped rice barges, the boats now have modern amenities, including air con and a comfortable bed. What better way to see the lakes and lagoons as we leisurely cruise to meet our bikes again. We dock at Alleppey, and find our bikes waiting for us. This morning's ride will be flat as we take an old canal road, passing historic buildings and taking in the serene view of this small city. We then ride north along the coast to Marari beach for a seafood lunch and a bit of relaxation. We continue riding past fishing villages as we near our final destination of Cochin. We will end the tour at your city hotel. The bikes are well-known makes of mountain bikes with lightweight alloy frames, 24- to 27-speed gearing, disc/v-brakes and Shimano components and front suspension. If you bring your own bike, please make sure it is a mountain bike, preferably with front suspension, and that it is in good mechanical order. Please make sure that your passport is still valid for at least six months at the end of the tour. An electronic visa (e-visa) is available for passport holders of 150 countries including Australia, New Zealand, UK, USA and citizens of EU countries, with the application and the fee submitted at least 4 days before date of arrival. Fees vary depending on nationality. The visa is valid up to 60 days from the date of arrival. Visit here to apply and for the full list of eligible countries. For citizens of countries not specified a visa must be acquired before arriving in India. Please contact your local Indian embassy to receive a standard tourist visa. Locations on embassies worldwide are available here. There are no compulsory vaccinations although it is strongly recommended that you are vaccinated against Typhoid, and Hepatitis A and B. Tetanus and polio vaccinations should also be up to date at the time of travel. Please speak to your doctor/physician for the most recent information. As India is such a large country, the climate and weather conditions vary across the vast region. However, the country is divided into six main climatic zones ranging from arid desert in the west, alpine tundra and glaciers in the north, and humid tropical in the southwest and the island territories. Rajasthan: weather can be divided into four seasons - summer, monsoon, post-monsoon, and winter. Summer from April to June is the hottest season with temperatures ranging from 32C to 45C. Monsoon extends from July to September with a slight drop in temperature but plenty of rain. The post-monsoon period is from October to November where the lowest temperatures can reach as low as 18C. From December to March is the cold season and the best time to visit Rajasthan. Temperatures range from 15C-18C with little or no humidity. Kerala: mostly has a tropical wet climate, which can be divided into three seasons. Summer is from February to May and is generally hot and humid. Monsoon season begins in June till around October or November. December to January holds the best weather for travel as it is cooler and the rains have subsided. Leh/Ladakh has a cold desert like climate with somewhat extreme conditions. summers bring in harsh direct sunlight at such high altitudes while winters can get as cold as below freezing point. Lowest ever recorded was -23C. May to August is the best time for tourists to enjoy the weather and everything it has to offer. Sikkim: has a very temperate climate with enjoyable 5 seasons. Depending on the location and altitude, the weather can vary. In Summer, the lowest temperatures reach 13C up to 28°C while in winter Temperature between 0C to 13C. The monsoon season hits around June to September. Meals are included in the itinerary where B = breakfast, L = lunch, and D = dinner. Any special dietary requirements can also be catered for as well. Please let us know at the time of booking. Keeping you completely hydrated is a job we take very seriously. Cold water and energy-restoring drinks are included in the tour price while riding. Soft drinks and other beverages during meals are not included. Beer and alcohol are available, but NOT included in the price. We recommend that you tuck away a few extra dollars a day for incidentals. Included entrance fees are those for the listed sites and national parks that are part of the itinerary. Any other site fees are not included. The currency is the Indian rupee (Rs) and there are ATMs in major cities and most towns that take international cards. However, we suggest that you withdraw money at the airport at the start of your tour. During the tour, our guide will inform you of the ATM locations in different cities.